2019 is the ninetieth anniversary of the last issue of the L'Amic de les arts (Sitges, 1926-1929) and the first one of Helix (Vilafranca del Penedès, 1929-1930); both are relevant titles to the study of the first Catalan avant-garde movement, which scopes from 1916 to 1936. The term “avant-garde” –which appeared in the context of the capitalism crisis and the First World War- includes all the styles that broke the rule established before: impressionism, futurism, surrealism, and so. It arrived in Catalonia from Italy and France. The Catalan avant-garde movement was expressed through the singularity of its highlighted personalities from art and literature, even though they never constituted a programmatical stable group. In some magazines, like L'Amic de les Arts, coexisted the “noucentistes” with avant-garde creators. Other, like Iberia or L’Esport català, do not belong to this trend, although they included some avant-garde works; for instance, the first calligram by Josep Maria Junoy dedicated to the pilot “Guynemer”, published in the magazine Iberia or the Carles Sindreu calligrams published in L’Esport català. In general, the Catalan avant-garde titles were of short length; they had relevant writers and artists of that time, as the mentioned Josep Maria Junoy, Joan Salvat-Papaseït, Josep Vicenç Foix, Sebastià Gasch, Joan Miró, Joan Ramon Masoliver, etc. 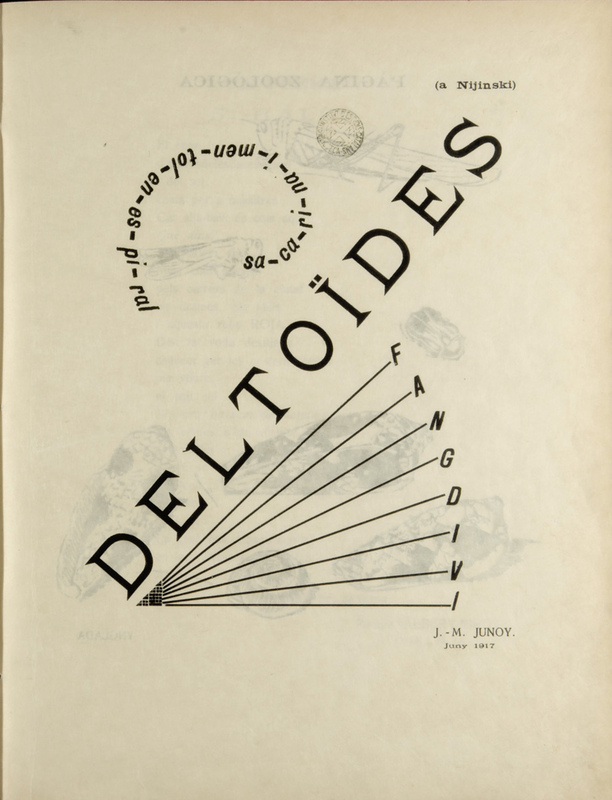 The first avant-garde titles recognized as a result of the avant-garde thought were Themis (Vilanovai la Geltrú, 1915-1916), directed by Rafael Sala, who, together with some collaborators, introduced the futurism, and Trossos (Barcelona, 1916-1918), directed by Josep Maria Junoy, who published in it translations from French authors, as well as works of himself and from Josep Vicenç Foix and other. Among the draftman were names as Pere Ynglada, Joan Miró, Enric C. Ricart, etc. It must be added to them the emblematic magazine 391, published in French in Barcelona by the dadaist Francis Picabia, that significantly reinforced the avant-garde movement in the Catalonia of 1917. Chronologically, three titles followed the ones mentioned above, that were fully considered of avant-garde; they were the result of the initiative of Joan Salvat-Papasseït: Un enemic del poble (Barcelona, 1917-1918), Arc voltaïc (Barcelona, 1918) and Proa (Barcelona, 1921); it was also remarkable the only issue of Fulls grocs (Barcelona, 1929), promoted by Sebastià Gasch, Lluís Montanyà and Guillem Díaz-Plaja, that in 2019 celebrates its ninetieth anniversary. L’Amic de les arts (Sitges, 1926-1929), with 31 numbers published, was the longest avant-garde title; this probably was because of its diversification of contents with opinions and works from other trends. Directed by Josep Carbonell, it had a broad number of collaborators: Josep Vicenç Foix, Cassanyes, Planas, Dalí, Montanyà, Gasch, Miró, Barradas, etc. It should be highlighted number 17 focused on the avant-garde art. Joan Ramon Masoliver, the life and soul of the magazine Helix (Vilafranca del Penedès, 1929-1930), was a fervent disseminator of futurism; the Biblioteca de Catalunya hods his collection. 10 issues of this magazine were printed by the Claret publishing house of Vilafranca del Penedès. Some of the illustrations were by Joan Miró and Rafael Barradas. 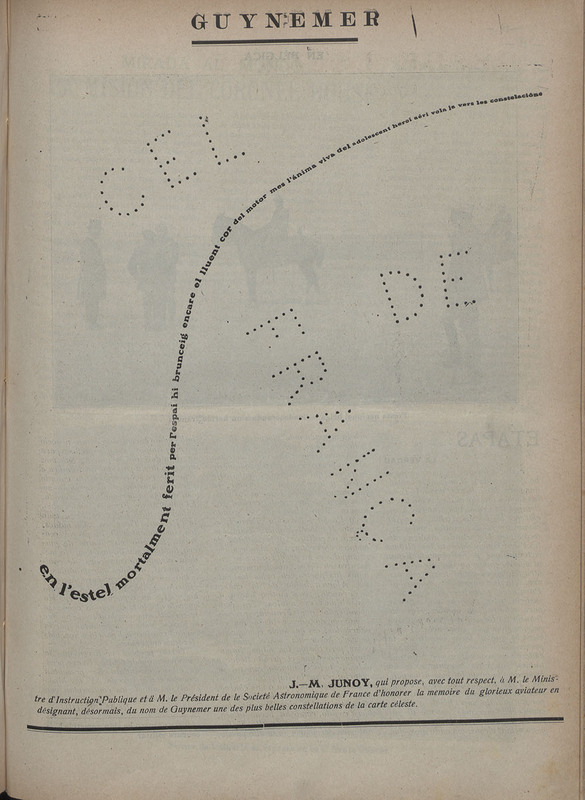 Helix suffered the censorship of Primo de Rivera and due to this, the page title article wrote by Giménez Caballero in the number 5 was suppress. 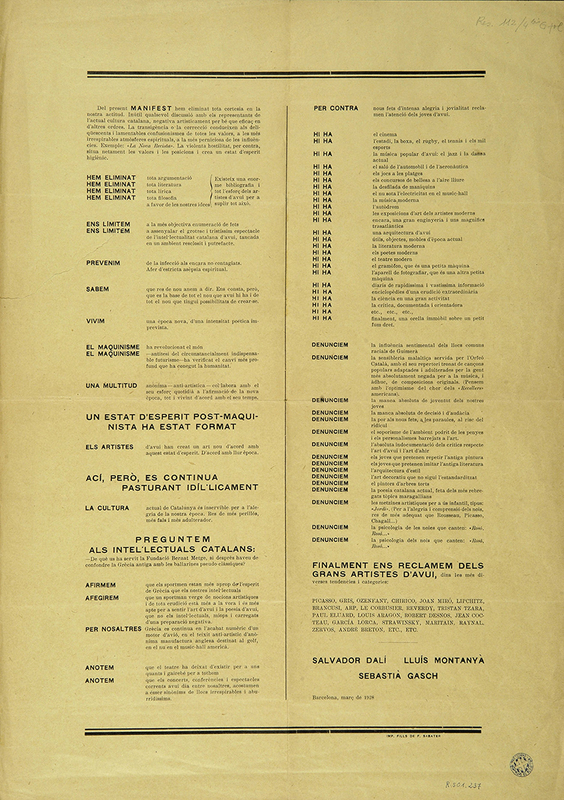 The first avant-garde in Catalonia arises it maximum expression with the Manifest groc (1928) signed by Dalí, Gasch and Montanyà, and with the constitution of the GATPAC (Grup d'Arquitectes I Tècnics Catalans per al Progrés de l'Arquitectura Contemporània), that introduced the rationalist architecture in Catalonia and published the magazine A.C.: documentos de actividad contemporánea (Barcelona, 1931-1937). Biblioteca de Catalunya Carrer de l'Hospital, 56. 08001 Barcelona. Email: arca@bnc.cat Tel. : +34 93 270 23 00. Fax: +34 93 270 23 04.